Tom Roche (69) from Offaly fears what the future will hold for him after he fell into mortgage arrears. 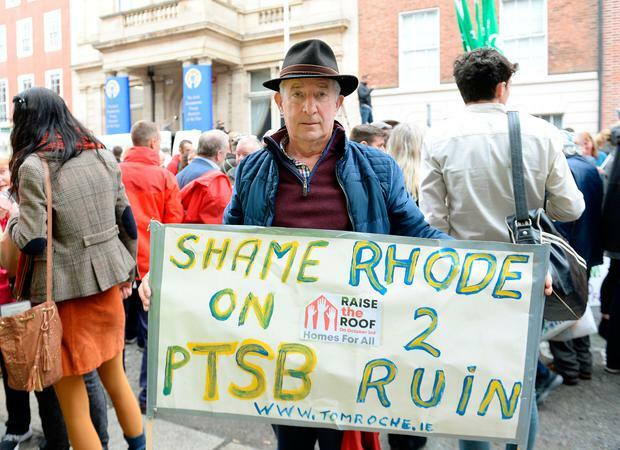 He was one of the thousands who attended the Raise the Roof rally in Dublin yesterday to show his support for people affected by the current housing crisis. A carpenter and cabinet maker by trade, he ran the Just Forests organisation for 30 years, but funding for the organisation dropped significantly when the banking crisis hit, and he lost his salary, and fell into arrears. "I can't believe at this age of my life I am looking at the possibility of losing my roof. I can't believe that is happening in the country that I loved, the country that I worked so hard in all my life. I can't believe it is happening to me. It is like a nightmare." He had borrowed €150,000 at the age of 59 and was given a 10-year mortgage by his mortgage provider, and at that time the €1,400 a month repayments were within his means. He said that he was very confident at that stage in relation to the repayments. "I paid back almost €70,000," he said. But when he lost his salary, he was unable to continue to pay his mortgage. Mr Roche, who lives in the village of Rhode, said that he took a proactive approach and told his mortgage provider. He has been engaged in a process to try to resolve the situation to the satisfaction of all sides, but there has been no resolution to date. He said the mortgage provider is now seeking €165,000, which includes penalties. He is keen to remain in his house because he has a carpenter and furniture restoration workshop behind his house, which provides his source of income. He lives on his own. "I have worked all my life. I have been working since the age of 13, since I left school, always self-reliant, never had my hand out for anything." He is hopeful that what he believes to be a fair and equitable solution can be found to the problem. "I want to be treated fairly," Mr Roche added. Charlie Weston People planning to buy a home have every right to feel furious about the activities of cuckoo funds snapping new developments en masse. More than 60 homes have been sold at Meadowbank since the new Swords development launched in early February beside Millers Glen, the scheme that hit the headlines in 2014 for being the first major new scheme in north Dublin in seven years.